When investment firm Piper Jaffray initially tested Siri in June, its list of common queries found that Google was responsible for about 60 percent of the data returned. Now, with iOS 6, Google is responsible for only 30 percent of the data. "The biggest change in query resolution to Google was the removal of Google Maps in iOS 6, as 23% of queries resolved to Apple Maps," analyst Gene Munster wrote on Thursday. "Yelp and Yahoo! also benefited slightly. Net-net we view this as a slight negative for consumers on Apple products as we view Apple Maps as an inferior product to Google Maps." The latest tests also found evidence of behind-the-scenes improvements to Siri, though the changes have been slight. 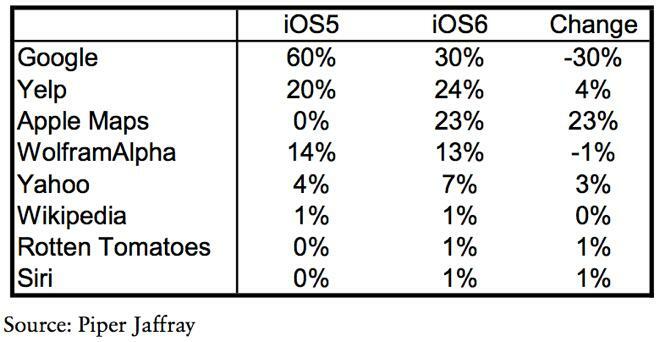 In iOS 5, Siri understood 89 percent of queries spoke in a quiet environment, while that improved to 91 percent in iOS 6, while 76 percent of queries were answered correctly in iOS 5 and that improved to 77 percent with iOS 6. 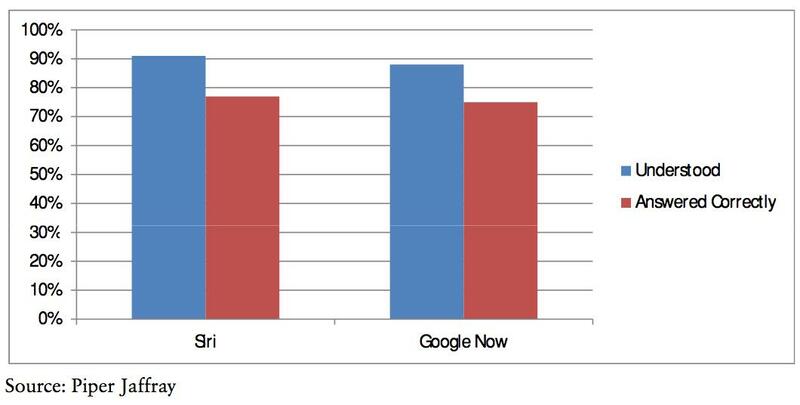 Since Piper Jaffray's first Siri test, Google has launched its own voice-driven assistant service, dubbed Google Now. For the latest test, Google Now was included to offer a head-to-head comparison with Siri, and found that Apple's service has a very slight advantage. "It appears the two voice assistants are comparable to one another in terms of understanding the spoken query and returning the correct result," Munster wrote. "In our test, Siri correctly understood our queries 91% of the time in a quiet environment compared to Google Now at 88%. In terms of accuracy, we determined that Siri accurately answered understood queries 77% of the time compared to 75% for Google now." Munster said the tests showed that Siri's greatest strengths are in local search and operating-system-level commands. Google Now, meanwhile, has its strengths in navigation and fetching information. "For example, Siri enables full control of the music application via Siri, but Google Now does not understand all song change/pause commands," Munster said. "We believe Google will eventually strengthen its ability to control the OS in future launches." One area where both Google Now and Siri are lacking, he said, is in commerce. Munster believes that Apple will integrate with local deal companies such as Groupon and Living Social to enhance commerce assistance with Siri.